I really, really love these chocolate pizza pockets! What a treat! And both fillings look so delicious, especially the dark chocolate (I also saw Jeanne's post and her addition of chili and it had my mouthwatering!). I really must try this as a dessert one time. And YES to the carbs/chocolate once a day! 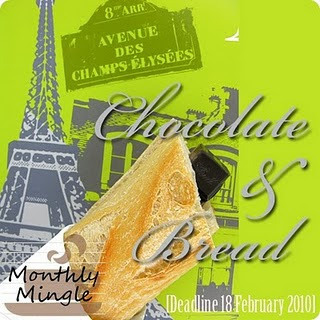 I mean, I did come up with the theme of the Monthly Mingle :-) Thanks so much for participating! Thanks so much for the lovely comment, Jamie. You made me feel very welcome to the wonderful world of blogging. These look fabulous! That dark chocolate filling sounds absolutely wonderful... and I think it was such a great idea to add nuts with the chocolate. I recently had some chocolate truffles with cinnamon and cayenne and discovered that I like that spicy/sweet combination. I will have to make these at some point. It really is a delicious combination, Megan. I think I will also try it as a sauce with vanilla ice cream. Bit of a grown-up chocolate sundae. Wow that looks amazing! This will really satisfy my chocolate cravings.